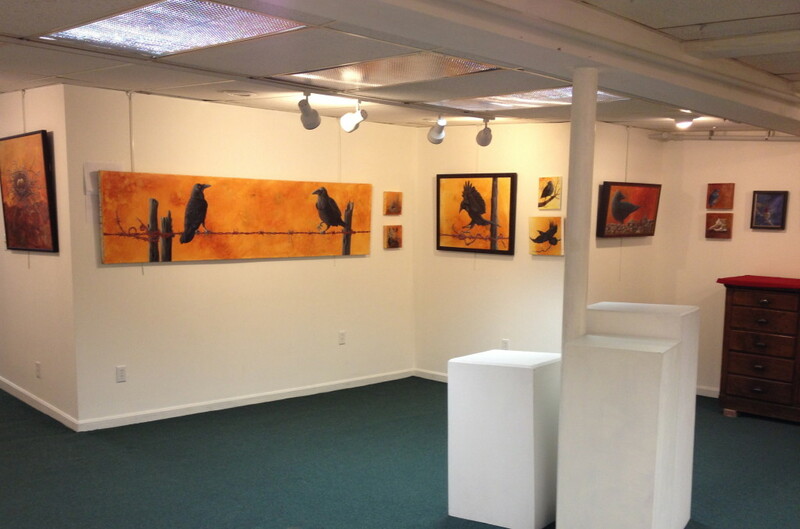 It was a brilliant, bitter cold day last Friday as I drove north to hang my show in the Back Room Gallery in St. Johnsbury, Vermont. The show is at the North East Kingdom Artisans Guild. It will be up until February 28, 2013, so tell your friends and stop by! It’s quite near Burke Mountain Ski Resort. Somehow I packed 36 paintings in Georgia, my burnt-orange Honda Element. I hung 34 of them. As I drove north I thought about what it takes to hang an art show. #1 Art (Do the work) Many hours, days, weeks and months of work, if not years, go into preparing for a show. The paintings for this show are selected from the last several years. I didn’t bring the most recent work that I had done at the Wurlitzer Foundation last spring since it very southwestern. And St. Johnsbury is VERY northeastern. Only an hour or so from the Canadian border. #2 Let people know! (publicize!) Social media such as twitter, facebook, google+ and blogging are all great ways to get the word out. Snail mail cards are lovely reminders as well. Though they are more costly, they last much longer. #3 Transport the work. (get it there!) Loading my vehicle is always a laughable event. I treat my car like one big box, packing paintings vertically aligned, with mat board and bubble wrap layered between them. Often I put the paintings in felt bags which I sewed especially for this purpose. This show was a particularly challenging packing job since I took an 8′ painting. This made visibility marginal so I had to drive with extra caution. 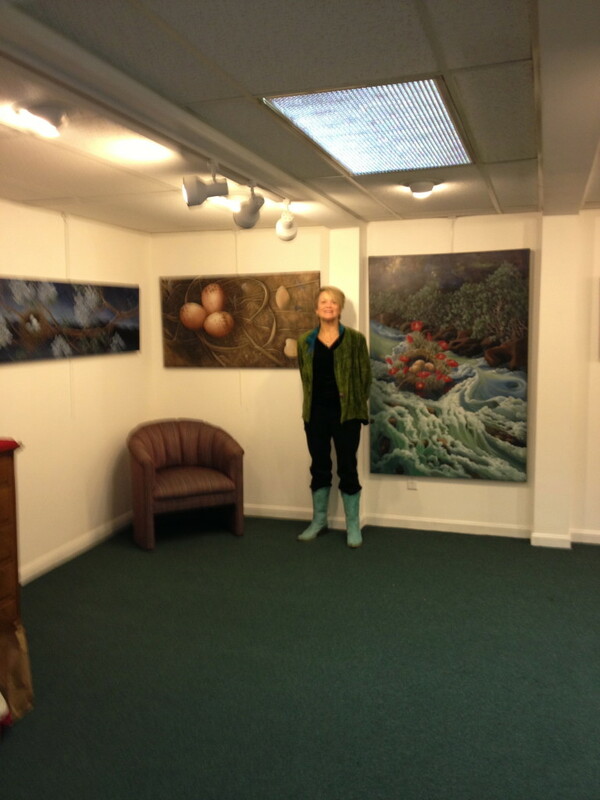 I began hanging with the hot colored paintings. The long painting of two ravens on barbed wire is titled “Conversation” That’s the 8′ one that made driving a challenge on my way north. There are several alternative approaches to determining the best layout for your show. You can hang the work chronologically, thematically or as I did in this case, chromatically. I grouped the hot-colored images in one area, then transitioned the colors from warm to cool around the room. #5 Be there (at the opening!) The only way to meet potential patrons is to be there at the opening. Especially if you live a distance away, which in this case I did. And it feels great to hear the comments. Usually they are quite positive. At this opening a total stranger walked in and announced (jokingly) to everyone that he had done all the paintings. I congratulated him on the great work. It was very funny when he found out I was the artist. And there were several people who had driven quite a distance to see the show. Had I not been there at the opening I wouldn’t have had the opportunity to meet them. #6 Record the event. (Take lots of photos!) I already have high quality jpgs and images of all of the paintings individually but I am kicking myself for not taking more photos of this particular show installation. And even more so for not checking the quality of the ones I took while I was there. I’m sure there are steps which I’m skipping. If there’s something crucial you’d like to suggest, please add it in comments!